It looks like it will be two weeks in a row with a less than stellar line-up of new releases on Netflix Instant this week. Don't worry though because they're not slowing down adding titles, but it rather looks like they're gearing up for a huge influx of new titles being added the last week of March and first week of April. Still, there are a couple great new releases this week, and to round things out, I've went ahead and tossed in a few more choices from my own queue as well. A couple indies, a documentary, an Academy Award nominated performance from last year and more in this week's installment. So what should you be watching this week? Though it's not exactly a feature length film, it does feature cinematic talent, and, as we've heard recently, the potential for a big screen sequel. 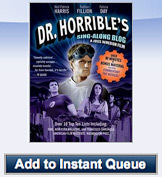 Neil Patrick Harris stars as the villainous Dr. Horrible whose love for the beautiful red-headed Penny (Felicia Day) has him messing up his chances of joining the Evil League of Evil as he continually finds himself and his evil plans (not to mention his romance) thwarted by Captain Hammer (Nathan Fillion). If this is your first time hearing about this comedic musical from Joss Whedon, then you probably need to download the new Internet, because it's huge, hilarious and well worth 45 minutes of your time. Plenty of people like stop-motion animation from the likes of Henry Selick (Coraline, The Nightmare Before Christmas) and Tim Burton (The Corpse Bride), but how about an Israeli stop-motion animated film from director Tatia Rosenthal. 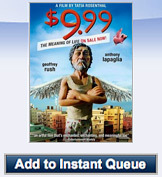 If you need a little bit of incentive to check out this inventive flick, Geoffrey Rush and Anthony LaPaglia lend their voices to this story of Dave Peck who discovers a book about the meaning of life, snatches it up for the bargain-basement price of $9.99 and blossoms into a voracious reader determined to share the book's secrets with everyone he knows. A rare film in director Martin Scorsese's career that is one of his few films that doesn't contain graphic violence and is vastly underrated. 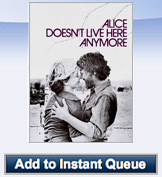 Ellen Burstyn won an Academy Award in her portrayal of Alice Hyatt in the story of a destitute widow who must find the strength to go on for her young son in the face of loneliness and fear in the 1970's. Almost as if a prelude to his being referenced in Taxi Driver, actor/singer Kris Kristofferson also turns in a solid performance in a film that spawned the popular sitcom "Alice." Sure he's all slick and modern as Iron Man, but in the 90's Robert Downey, Jr. ventured back to a time before green screen and even sound in his much lauded portrayal of iconic silent filmmaker and actor Charlie Chaplin. Directed by Richard Attenborough, the film jumps around to different periods in Chaplin's life through his many successes, failures and government persecution. The all-star cast also includes Anthony Hopkins, Dan Aykroyd, Kevin Kline, Marisa Tomei, Diane Lane, David Duchovny and even Chaplin's real-life daughter Geraldine Chaplin. One of the most underrated animated films of all time was directed by one of the most respected animation directors today: Brad Bird. That's right, one of Pixar's golden boys first directed this charming 50's sci-fi influenced story of 9-year-old Hogarth as he finds a colossal but disoriented robot (voice by Vin Diesel of all people), and the two form a strong bond of friendship. Before long, however, a government agent (Christopher McDonald) is on their trail. Harry Connick, Jr. and Jennifer Aniston round out the cast in a film that is simple in its storytelling, but nothing short of spectacular. The main reason to watch this one is a fantastic performance by Meryl Streep (when isn't she great?) 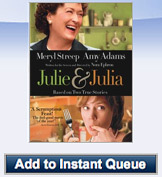 whose Julia Child portrayal is spot on as well as containing a wholly more interesting story than the intercut modern story of Julie Powell (Amy Adams) who wrote the book that the film is based on (and whose blog was the inspiration for her story). The film is charming, but it's nothing spectacular. However, you're definitely not going to want to watch this on an empty stomach because the food featured is almost as enticing as Amy Adams. Adam Scott proves you can play the same role of a douchebag brother (his first turn was in Step Brothers) but have two drastically different characters as he puts in a stellar performance as Caleb, an overbearing, jerk of a brother who is perpetually stricken by a bad break-up. Caleb reluctantly agrees to drive his college age brother Peter and his girlfriend from schoool, Emma, home for Thanksgiving, but a strange attraction to her may have drastic consequences before the return trip home. 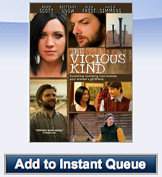 This indie drama is full of subtle, but spectacular performances from Scott, Brittany Snow and J.K. Simmons. Derek Zoolander once asked, "Have you ever wondered if there was more to life, other than being really, really, ridiculously good looking" The people in this documentary would respond with a resounding"no." 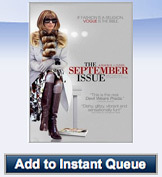 This interesting doc offers a rare look inside Vogue, the fashion magazine, as they prepare the infamous September issue, one of the most anticipated magazines that hits newsstands every year. Director R.J. Cutler captures the demanding creative process in action for nine months, following perfectionist editor Anna Wintour and creative director and stylist Grace Coddington as they attend fashion week in Europe. I just watched the Iron Giant for the first time a few weeks ago and it was terrific. Great recommendations here. Of these I've seen Dr. Horrible, Alice Doesn't Live Here Anymore, Chaplin, The Iron Giant, Julie and Julia, and The September Issue. Great stuff. Is this the first time doing "This Week on Netflix Instant:"? If so, keep it up! 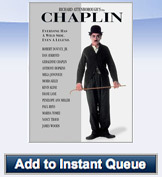 Im always looking for a list of new instant movies. 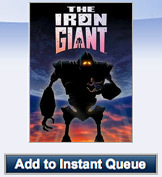 Good call on the Iron Giant, great movie! yes, please keep this going. @ Clint, This is actually our second month doing "This Week on Netflix Instant!" Click on the tag that says "Netflix Instant" at the end of the post to see all the past installments! Glad you like it!